10.07ct Danburite, 12.32 x 12.22 x 9.61mm, near eye clean, untreated, cut by yours truly in Marco Voltolini's "Squartuguese" design. I don't know about you, but I love that design. The rough was mined in Madagascar. You're not familiar with danburite? Well, it's a calcium boron silicate. What, that doesn't help? Danburite is primarily a collector's stone, and was named for Danbury, Connecticut, where it was first discovered. The Danbury deposit is now deep under the city, and no known gem-quality pieces came from there. This particular stone, as noted above, comes from Madagascar. 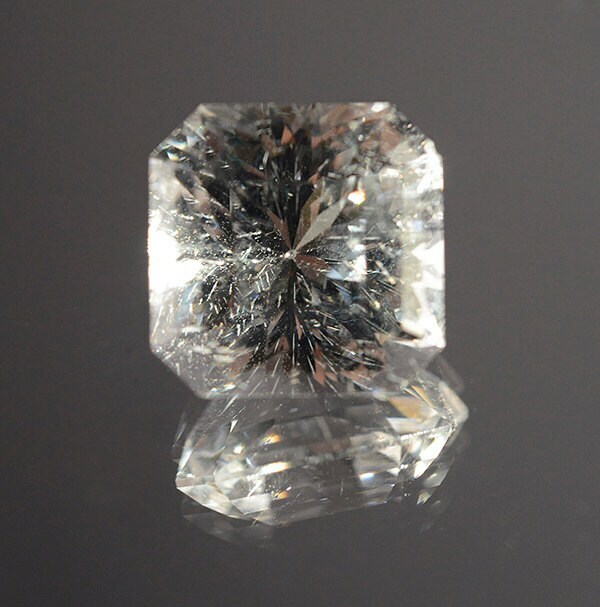 It's harder than quartz, and often has more brilliance than topaz, making it an ideal jewelry stone, especially in a pendant. Remember, 'colored' gemstones (really, anything but a diamond) are best measured by their dimensions when comparing across species. This 12mm danburite would weigh more than a quartz of the same cut & size, but less than a cubic zirconia, and density does not imply value.